When you plunk down $9.50 for a night out at the movies (or $15.00 if you don’t sneak in some snacks) what part of the movie makes that cost totally worth it for you? It could be multi-million dollar special effects, a surprising deux ex machina, or anytime Robert Downey Jr. appears on screen. For me, a good montage scene can be worth the price of admission. Few, if any, are better than the montage depicting Tony Montana’s rise to power in the original “Scarface” masterpiece. I mean, how many movie montages have their own theme song? Of course I’m referring to “Push It to the Limit” and that song is exactly what brings me to the new line of aggressive looking RS-1 graphics from Bell. 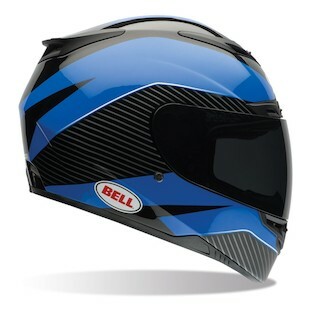 When I look at the Bell RS-1 Gage Helmet, I can almost hear that 80’s power ballad playing in the background as I picture teams of Bell’s graphic designers and engineers scurrying around a top secret facility. There are white lab coats everywhere, rejected designs litter the floor, and at least one guy is staring intently through a test tube in my mind’s movie montage. The Gauge graphic is the dazzling result of that montage-worthy hard work. 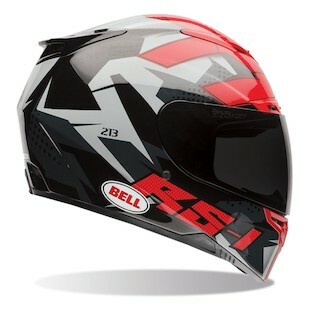 I think “Push It to the Limit” when I see this helmet because that is exactly what Bell has done with this new graphic. The RS-1 Gauge features a striking mix of gloss blue and matte black finishes that incorporate some incredibly sharp pinstriping and powerful, angular lines. If they sought to make a helmet that looked fast while sitting still, then mission accomplished with the RS-1, which can seamlessly move from tearing up the track to tearing down back roads. The versatility of this lid can be seen through a wide-variety of graphics as well, such as the Bell RS-1 Topo helmet, which takes jagged edges and chaotic styling to a whole new level. A Kevlar and Fiberglass composite keeps things light weight, and a Snell safety rating means that you’re not compromising a bit on strength. It may be what’s on the inside that truly matters, but the new Gauge graphic on the outside makes the Bell RS-1 simply badass from every dimension. 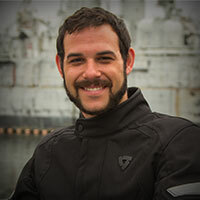 Bell has no doubt pushed themselves to the limit to bring this helmet to market for 2015, and it’s a must have for anyone looking to do the same with their riding.